Hydra – 31 Dell OptiPlex 7040 computers with 3.4 GHz Intel Core i7-6700 processors, 16GB SDRAM and nVidia GeForce GT 745 GPUs. The computers run the Red Hat Enterprise Linux 7. Installed applications include CodeLite, CUDA, Eclipse, GIMP, NetBeans, MATLAB, Synopsys Saber and a variety of open-source software applications and development environments. Tesla – 31 Dell Optiplex 9020 computers with 3.4 GHz Intel Core i5-4670 Processors, 8GB 1600MHz DDR3 SDRAM and nVidia GeForce GTX 645 GPUs. The computers run the Red Hat Enterprise Linux 7. Installed applications include CodeLite, CUDA, Eclipse, GIMP, NetBeans, MATLAB, Synopsys Saber and a variety of open-source software applications and development environments. eduroam – a secure network available to faculty, staff, and students. In addition to wireless access at UT, faculty, staff, and students are able to obtain Internet connectivity when visiting other participating eduroam institutions. ut-open – an unsecured network available to faculty, staff, students, and visitors. A new portal will be put in place to manage network registration and visitor access. The EECS departmental infrastructure provides LDAP authentication, web, file/print, and database services. Local research facilities include ADA – multiple Dell PowerEdge servers running a broad selection of licensed engineering applications including products from Agilent, Altium, Ansys, Cadence, Comsol, EMA, GE, Mentor Graphics, Manitoba, Plexim, Siemens, Sonnet, and Synopsys. EECS members also have access to the The Advanced Computing Facility (ACF). ACF is made possible through a partnership between the Joint Institute for Computational Sciences (JICS), the University of Tennessee Knoxville (UTK), and the University of Tennessee Health Science Center, faculty investment from both campuses, and other partners, with the goal of consolidating computational resources, user support, and investments across the State to provide researchers with a significant, regional-class computing resource managed by a national-class staff. The University of Tennessee-Knoxville’s Office of Information Technology (OIT) is responsible for managing a complex network that spans the campus and remote sites throughout the state. OIT Network Services’ responsibilities include the management of the local UTK network (both wired and wireless), multiple wide area connections, and Internet/Internet2 connectivity. In addition, the group manages various security devices such as firewalls, VPN (Virtual Private Network) access devices, IPS and IDS devices (Intrusion Prevention/Detection Systems). At its core, the UTK network supports speeds of 10 gigabits per second (Gbps) and greater. 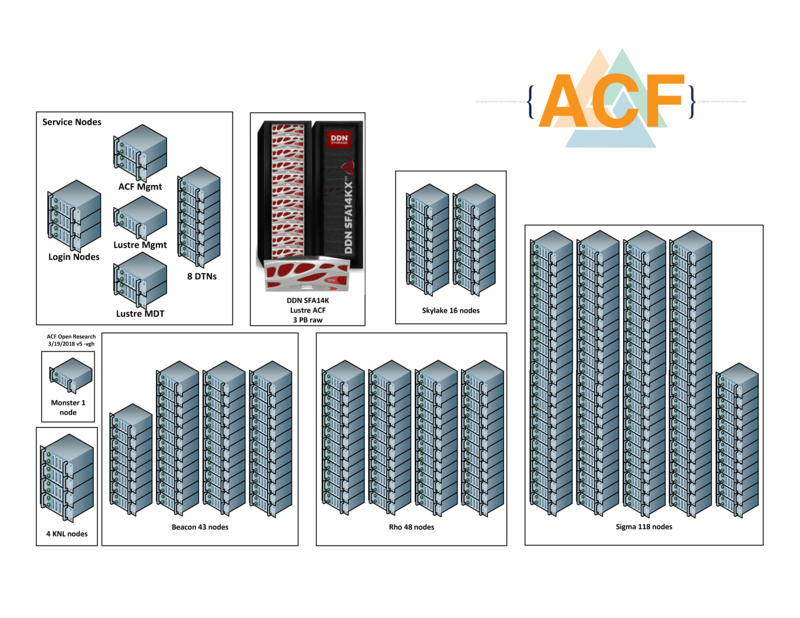 Buildings are dual-connected with at least 1 Gbps, with many featuring 20 Gbps connections to the core in order to accommodate applications that require very high bandwidth. Overall, the campus network supports approximately 27,000 100 Mbps connections, 38,000 Gigabit Ethernet connections and 5,400 Ten Gigabit Ethernet connections. A state of the art wireless network consisting of more than 5,600 wireless access points spans the entire campus. Remote offices are linked to the main campus network using connections ranging from 1.5 to 100 Mbps. Such locations include offices in Knoxville, Oak Ridge, Nashville, and Agriculture Extension facilities at various locations in Tennessee. Multiple, redundant connections provide the UTK community with access to the Internet at an aggregate speed of more than 10 Gbps. Multi-Gbps networks connect UTK to research facilities at ORNL (Summit supercomputer) and Internet 2 sites via Southern Crossroads (http://www.sox.net). UTK is a Sponsored Education Group Participant (SEGP), a program that allows us to sponsor other educational institutions’ access to Internet2 resources. Two core firewalls and a multitude of smaller, departmental firewalls, are deployed and managed by Network Services. Secure remote access is facilitated through VPN access devices (appliances) that support both IPSec and SSL/VPN access.